NightVision Outdoor Lighting uses a variety of creative landscape lighting techniques to turn your yard or deck lighting into a work of art. Each of these types of lighting styles has a different role. Some are used to focus light and attention on a single element, while others illuminate a wide area, and still others are used to define a boundary or act as guides. Our experts know how to incorporate all of these exterior lighting techniques to illuminate and display your deck and landscaping to its best advantage. Landscape lighting can draw attention to your outdoor features in an interesting and dynamic way. For example, our professionals can illuminate the canopy of your favorite tree from below. This type of lighting can have a very impressive effect, as the contrast between the dark leaves and the light from below is quite striking. NightVision Outdoor Lighting can also incorporate deck lighting elements in such a way that they create a sense of ambience without highlighting any one particular feature. We can even design a lighting set-up to mimic the glow of natural moonlight, creating an oasis of soft exterior lighting in your yard. We can also use our knowledge of landscape lighting to set your pond or garden apart from the rest of the yard and illuminate its best features. Your friends and family will enjoy the newly created atmosphere for years to come. 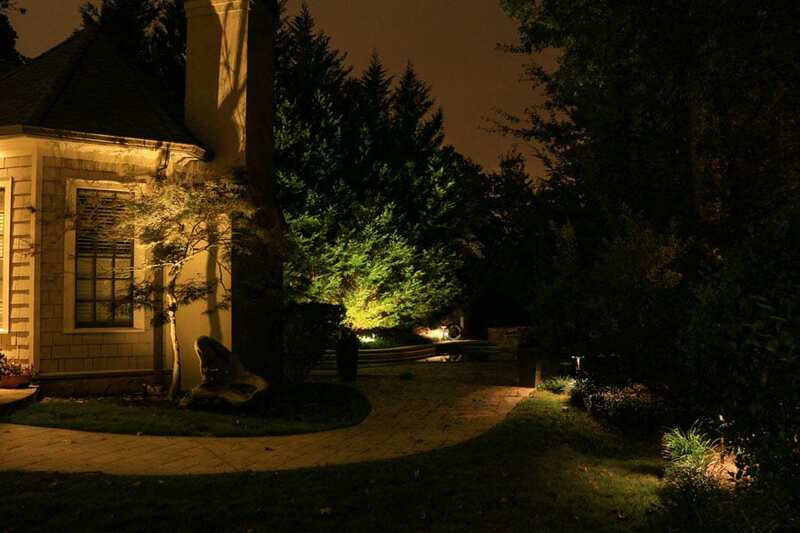 Whatever atmosphere you want to create, NightVision Outdoor Lighting can make it happen. Your yard may be unique and beautiful in the daytime, but without proper outdoor lighting, nobody will be able to appreciate your landscaping after the sun goes down. A customized deck lighting plan from our experts will ensure that your yard gets as much attention and admiration in the evening as it does during the day – maybe even more! The specialists at NightVision Outdoor Lighting can use lighting to transform your yard into a place for you to enjoy spending evenings. You will be proud to show off our work to your friends and family. We use only the highest quality fixtures; our outdoor lighting components are the best in the business. We will design and install exterior lighting for your yard to your complete satisfaction, as well as provide service and replacement landscape lighting fixtures. As local experts, we understand the unique landscape of Georgia and how we can maximize the appearance of your landscape based on the flora that exists naturally in our area. Our experts will use the newest lighting techniques to get the best ambience and contrast for your landscape and your desired look. As a local company we understand how to maximize the look of the Georgia terrain so that you are proud to spend your warm Southern nights outside with family and friends. We are confident that you will be pleased with the ultimate outcome of our deck lighting work. Call us today to see what our experts can do for you.